Thank You to my good friend Bella Lightner for snapping these pics of my look before the show! Rebekah Lux showed a gorgeous collection of throwback silhouettes and beautiful fabrics! I couldn't take my eyes off of each look as they made their way down the runway! I loved the bell sleeves, two pieced outfits, and wide legged styles paired with gold or silver heels and black socks! It had a 70's meets modern vibe that I could absolutely see myself wearing this spring! A couple of looks in particular really stood out to me, a yellow almost pajama styled two piece outfit was a serious show-stopper! I looked around as it was making it's way down the runway and everyone was snapping pictures of this look! The next was a pink almost shimmer pant with a gorgeous bell sleeved top to match! I loved it! Miranda Hanson is a returning designer to the KCFW runway and I could see a huge growth in her as a designer since she last showed. I loved her elegant pieces and the gorgeous fabrics, which made for an eye-catching, exciting presentation! I had a huge interest in this pretty lavender color on a couple of different looks including this high low strapless dress that would be a perfect bridesmaids look for my sister's upcoming wedding. She also showcased pops of green and ivory throughout this very earthy and girly collection. This Fall season I have had a major love for wardrobe pieces that could have come from my husband's closet! I am obsessed with over-sized jackets and blazers, so when I saw the DOUS collection come down the runway with the "Los Angeles, Tokyo, New York, Milan.." lettering on the streetwear inspired collection, I could have fallen out of my chair! LOVED IT!!! It was edgy, fun, and incredible well made pieces that I could have pulled from the runway and worn out of the show immediately! 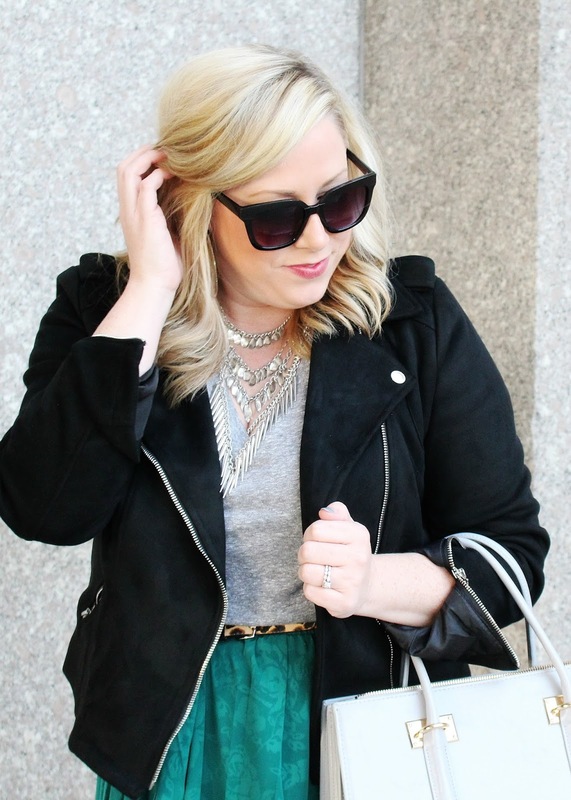 JANA STYLE® attended Kansas City Fashion Week as a Media Blogger. All opinions are my own. Love your outfit that you wore! Especially those shoes! The show looks like it was such a good time and so exciting that you got to go as media! 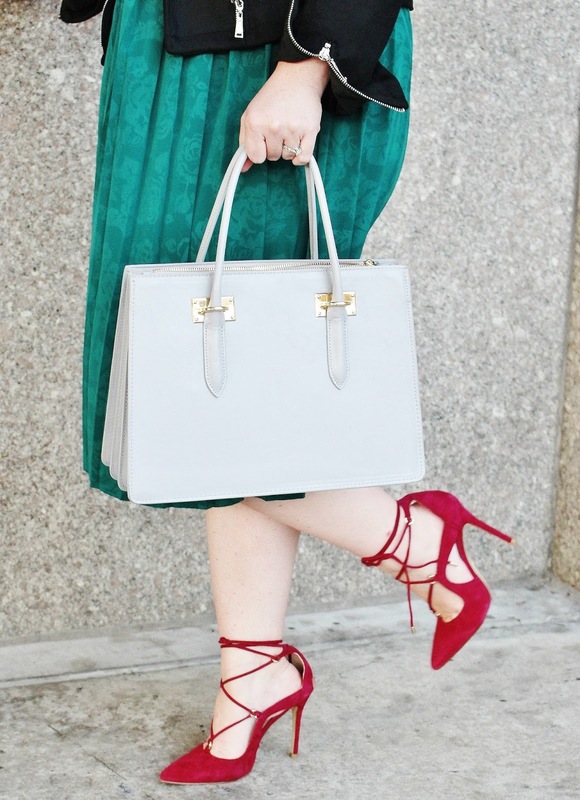 I am obsessing over those shoes and that skirt is divine! Hey Krissy! Thanks so much! Glad you love it! Love how you dressed up the basic tee here and all the colors you are wearing! Hi Jen! Thanks so much, Sometimes I forget how much fun it is to dress up a tee, it feels edgy but still styled. Thanks girl! All these looks are so fabulous!! I'm in love with the green skirt!! Rebekah and Miranda have gorgeous pieces! This looked like a fun night filled with amazing creations, and it seems like you enjoyed it a lot as an attendee! Love your shoes and necklace! I love your outfit and these looks! Love the photos, too! 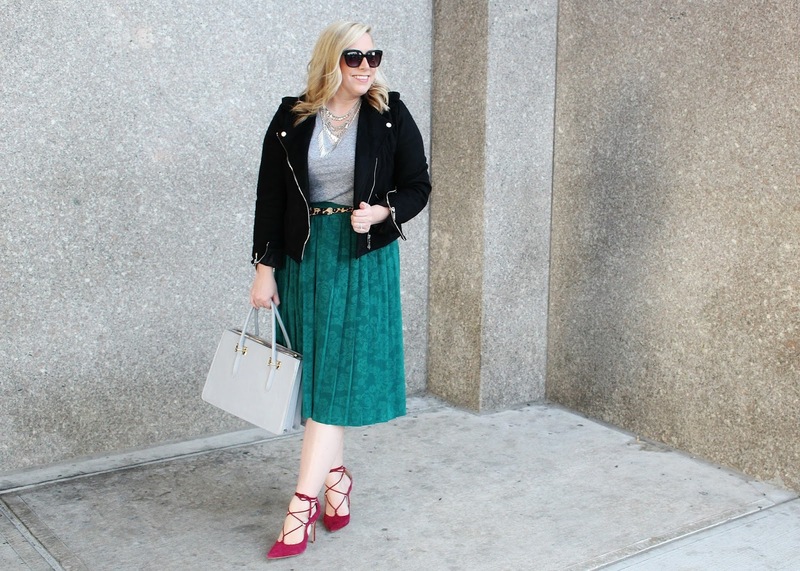 I am loving the mixture of colors in this outfit and especially that pleated skirt!! Gorgeous! Hey Kristen! Yeah, glad you love the pleats! Such a fun outfit to wear to the shows!